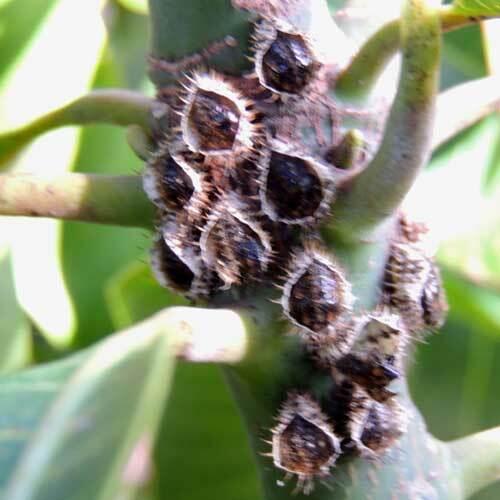 This group of immobile scale insects is attached to a twig of mango, Mangifera indica, in Eldoret, Kenya. December 2012. There are 8000 species of scale insects and many of them occur in Kenya. In my attempt to find a species name for these insects I found very few images of Kenyan species on the Internet. I am looking forward to a specialist who can corroborate in naming some of these images. The first minute instar nymph (first stage from the egg) is mobile with short legs and sometimes has a potential to be swept into the wind and carried about onto nearby plants. After the first instar moults into the second instar most scale insects are essentially sessile remaining attached to the plant by means of waxy cement and mouthparts that penetrate into the plant. The waxy coating is what can be seen and offers little hint about the nearly legless, flightless bug inside. Copyright Michael J. Plagens. Page created 25 February 2013.